The efforts of the government of India to find the historical roots of the mythical river Saraswati seem to have borne fruit. A seven-member committee headed by eminent geologist KS Valdiya has found scientific evidence of the river. In it heydays, the committee says, the river nourished northwest India and parts of the present-day Pakistan. This ‘revelation’ boosts the efforts of Haryana to ‘revive’ the river. Knappily presents Saraswati’s myth and reality. What are the findings of the committee? River Saraswati originated in the Himalayas. It was approximately 4,000 km in length. In India, it passed through Haryana, Rajasthan and north Gujarat and then it flowed through Pakistan before meeting the Western Sea through the Rann of Kutch. One-third of the river stretch fell in the present-day Pakistan. The longer, two-third stretch measuring nearly 3000 km in length fell in India. 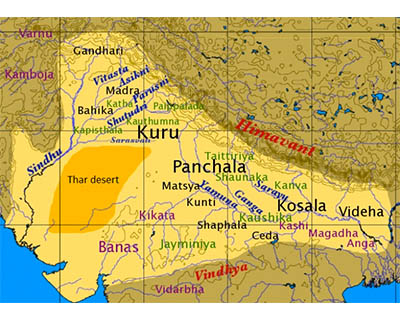 Historically around 1700 small and big towns and villages were located around the palaeo-channel concerned during the Harappa Civilisation. 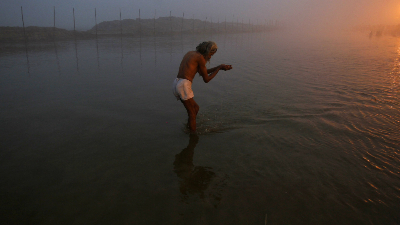 The flowing Saraswati provided water to these towns, villages. The river had two branches, western and eastern. Western Branch - It is represented by the Himalayan-born Satluj River of the past, which flowed through the channels of the present-day Ghaggar-Patialiwali rivulets. Eastern Branch - Palaeochannels of Sarsuti-Markanda rivulets in Haryana were courses of the eastern branch of river, known as Tons-Yamuna. The confluence of the branches was near Shatrana, 25 km south of Patiala. And suddenly, it crossed the Rann of Kutch and met the gulf of western sea. Note: Palaeochannels are paths abandoned by a river when it changes its course either due to movement of tectonic plates or severe floods and cut new ones, i.e., they are remnants of the once active rivers/streams. Why did the expert committee decide in favor of Saraswati? The conclusion of the expert committee was based on the following evidence found in their six-month research. Name: The name Saraswati was popular among people from Haryana and several structures and bridges in the state were named after it. The state’s revenue records also suggest so. 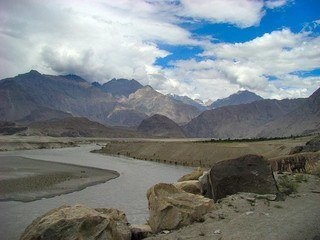 Origin: The mineral and chemical compositions of the palaeochannels at several spots across the catchment areas of Sutlej and Yamuna from Greater and Lesser Himalaya confirm that the river originated in the Himalayas. Course of river: It was ascertained based on the study of land texture of piles of sediments, their shapes and features which appeared to have been brought by ‘a big river’ and are reminiscent of the ones found in the present-day Ghaggar, Ganga and Yamuna. Also unique palaeochannels relating to the present-day Sarsuti, Ghaggar, Nara and Hakra rivers confirm the same. Length of river: At some 30-ft deep sand layer, five-km width palaeochannels were filled with water. This suggests that the relatively smaller rivers of today, like Ghaggar and its tributary Dangri, would not have brought such sediment. It must have been brought in by a big, flowing river. The report is an assertion of the assumption that River Saraswati originated from Adibadri in Himalaya to culminate in the Arabian Sea through the Rann of Kutch. It also points out that this river was once upon a time the lifeline of the north- western states of India and a vibrant series of civilizations from the mythological Mahabharata period to Harappa had flourished on the banks of this river. The report is sure to raise concerns, as various academics and opposition party members have been questioning the ‘biased’ search for the mythical river. When was the river ‘lost’? Saraswati, that started flowing nearly 10,000 years ago, began disappearing around 4000 years ago. The nemesis that overtook northwestern India’s prosperity along with the disappearance of the river Saraswati, has been a subject engaging several minds over the last hundred and fifty years. However, in the recent past convincing explanations about what caused all the changes were obtained through data gathered by archaeologists, geologists, geophysicists, and climatologists using a variety of techniques. The decline of Saraswati appears to have commenced between 5000 and 3000 BC, probably precipitated by a major tectonic event (or events) in the Siwalik Hills of Sirmur region. These destabilizing tectonic events were all linked to the uplift of the Himalayas. Presumably, one of these events must have severed the glacier connection and cut off the supply of glacier melt-waters to this river. As a result, Saraswati became non-perennial and dependent on monsoon rains. 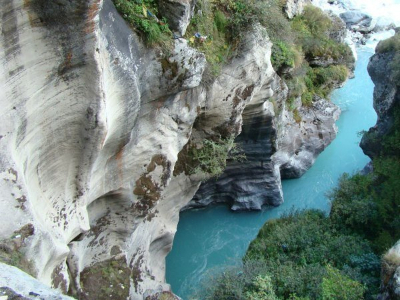 Bereft of waters through separation of its tributaries, which shifted or got captured by other neighboring river systems, Saraswati remained here and there as disconnected pools and lakes and ultimately became reduced to a dry channel bed. The Lost River: ‘On The Trail of the Sarasvati’, Michel Danino’s 2010 book, presents numerous arguments from topography, geological studies and satellite imagery to claim that the most possible reason for the loss of this river could be the change of the geographical structure of the plains due to tectonic plate shifts, causing diversion of one of its huge tributaries, Yamuna and a shift in the Sutlej's flow, leaving Sarasvati to be fed by a few streams originating from Aravalli. Where are the references of this river in ancient texts? River Saraswati has been glorified in religious literature, the Vedas (Rig, Yajur and Atharva), Manusmriti, Puranas and Mahabharata and referred to by various names like Markanda, Hakra, Suprabha, Kanchanakshi, Visala, Manorama etc. Hindu mythology refers to Saraswati as the goddess of wisdom and knowledge, manifesting itself in the form of a river. 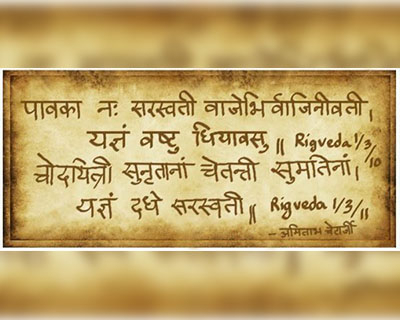 Vedic Texts: Rig Veda describes it as one of the seven major rivers of Vedic times, the others being Shatadru (Sutlej), Vipasa (Beas), Askini (Chenab), Parsoni or Airavati (Ravi), Vitasta (Jhelum) and Sindhu (Indus). It mentions Saraswati 45 times. Post-Vedic Texts: The epic Mahabharata has exalted the Saraswati River as covering the universe and having seven separate names. It is also believed that the battle of Mahabharata was also fought on the dry bed of Saraswati River. Archaeologist Marc Aurel Stein recorded in the 1880s that the easternmost tributary of Ghaggar was still known as Sarsuti at that time, which he said was a corruption of the name over a period of time. 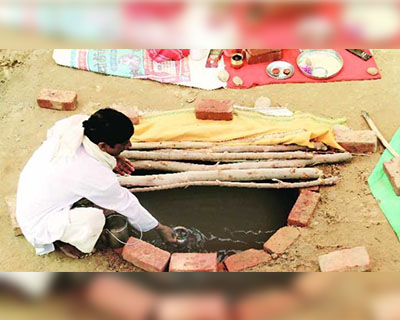 BB Lal, former Director-General of the Archaeological Survey of India (ASI), claims that the Rig Vedic Saraswati and the present-day Saraswati-Ghaggar combine, which flows through Haryana and Punjab and dries up near Sirsa, are the same. French scholar Michel Danino in his book The Lost River: On the Trail of Sarasvati suggests that Saraswati was no mythological river. He says there is strong evidence to suggest that the Saraswati of yesterday could be the Ghaggar of today. Scientific studies have been limited but point to the presence of an ancient river.It cannot however be concluded if the river is Saraswati as mentioned in the Vedic literature. “The data of the Central Ground Water Board and ISRO (Indian Space Research Organisation) satellite maps indicate that there are paleo-channels flowing under the ground. 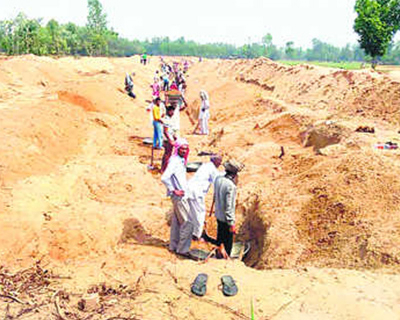 However, it has to be further analysed and studied whether these channels are Saraswati river,” Sriram Vedire, chairman of Rajasthan River Basin and Water Resources Planning Authority (RRBWRPA), told reporters in August. Who were the beneficiaries of this river? The answer to this question will make a number of assumptions, the biggest of them being that Saraswati indeed existed. Harappan Civilisation: Between 3500 and 1900 BC, the Harappan or Indus Valley Civilisation - the world's largest civilisation of the time - covered vast areas of modern day Pakistan and Western India from Kashmir to Gujarat. 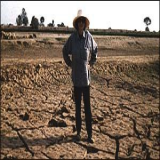 Its cities were spread across what appears to be a waterless desert in the western part of the Indian subcontinent. A careful plot of these sites suggests they lie along the path of a dried riverbed, and the river, if filled up, would rival the Indus in size. Present day Kurukshetra district: In revenue records, Saraswati travels from Adi Badri of Yamunanagar district to Pehowa in Kurukshetra district. There is a folklore associated with this site. Wherever the river flows, there are shamshan ghats (cremation grounds) on the embankment. The locals treat Saraswati as an equally holy river as Ganga and immerse the ashes in the open fields, believing that the river flows there. Present day Rajasthan: Archaeologists have conjectured that the arid area that is Rajasthan was once the beneficiary of Saraswati. They have discovered that there were priests, farmers, merchants and very advanced artists and craftsmen living there. Highly sophisticated seals on which there is evidence of writing have also been found, indicating that these people were literate, but unfortunately the seals have never been deciphered. How do the supporters of the ‘hunt for Saraswati’ defend their efforts? They claim that though critics say the projects looking for revival of lost rivers are waste of public money, such initiatives help in economic and cultural renaissance of sorts. Exact tracing the course of the river would be beneficial to the arid regions of Rajasthan. It would help prevent flooding in Yamunanagar, Haryana. It will also help in reclaiming thousands of acres of land that is rendered unusable during monsoons. It would also help in construction of a dam, artificial reservoir and channelising untamed drains during monsoons in the Northwest India. A recreational water park, botanical garden and zoo will also be constructed.The Chief Minister of Haryana has announced an express highway along the Saraswati Revival Project which will start from Kalka (Panchkula) and run up to Kalesar (Yamunanagar). A temple for Goddess Saraswati is proposed on the embankment of the reservoir. A historical gurdwara (Rampur Kamboyan) already exists. The finding of Saraswati River disproves the Aryan invasion theory, which states that Aryans who originally lived in central Asia migrated to India in around 1,500 BC attacking the local Dravidians and moving them south.